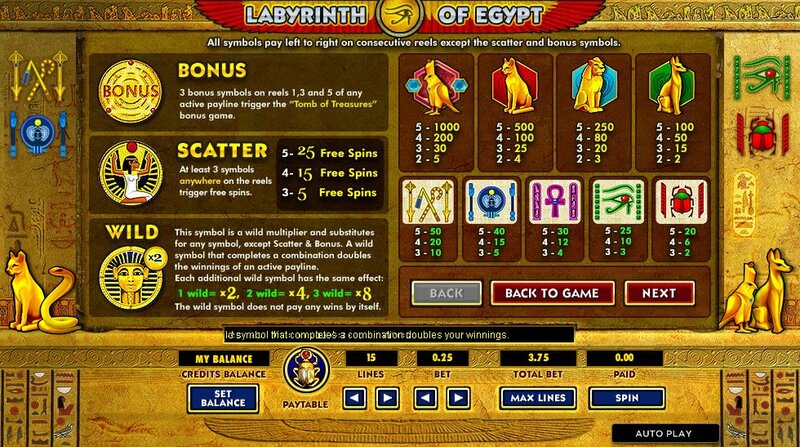 Get geared up to find your way through the Labyrinth of Egypt slot to find all the treasures you have ever dreamed of. With a nice big jackpot up for grabs, and an exciting bonus game, not to mention all those free spins up for grabs, this is definitely a slot to play today! As you enter this mysterious Labyrinth of Egypt slot game, your eyes will be assaulted with carved designs and colourful symbols galore. As you take your first spin of the reels, your ears will be delighted by music to walk like an Egyptian to. The sounds are divinely mystic, drawing thoughts and notions of ancient mummies coming out of the woodwork and all sorts of wondrous things. Your mind may wander to start pondering on where those pyramids actually came from, and where that labyrinth leads and what one may find at the very end of it. Once you have your head around the amazingly terrifyingly laborious labyrinths around here, you will want to take a good look at the graphic pictures in front of your eyes and what they depict. Full of golden statues, the gods of old that would not have been able to make their ways across the Nile for sinking to the bottom; we are also treated to hieroglyphics of all different colours that delight our eyes. 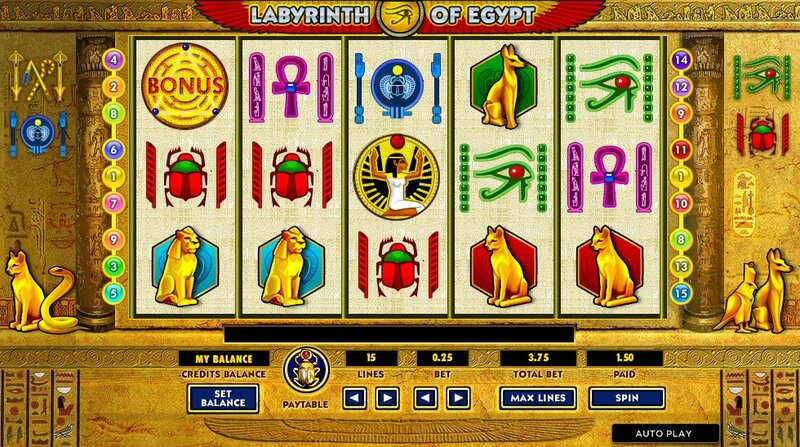 Grab a Labyrinth of Egypt wild symbol to substitute any symbol with the Pharaoh's head on a gold coin and multiply your winnings to put a smile on your face as well as the rulers. The atypical Egyptian image on a gold coin will scatter you to receive your free spins, up to 25 are available. 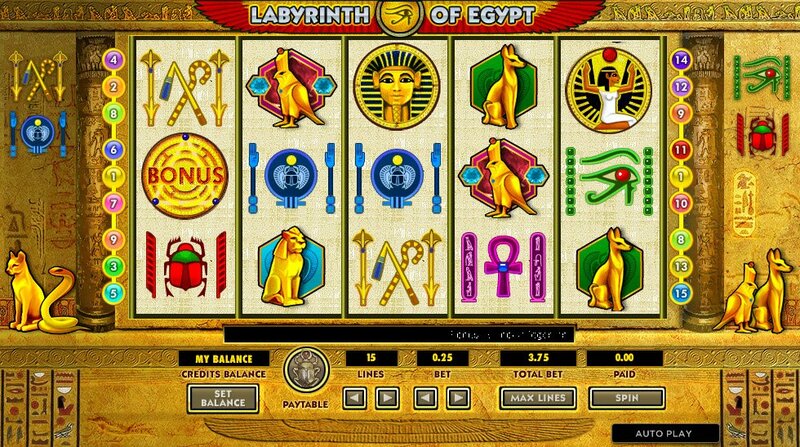 A golden coin with Bonus clearly spelled out on it will give you the Labyrinth of Egypt Slot bonus game we have all been waiting for. The Tomb of Treasure will delight you with a jaunt around the tombs in search of treasure, unlocking puzzles as you go. Hit the $80,000 Labyrinth of Egypt jackpot amount to really make you feel part of this bejewelled and golden ancient civilisation.